Rendering of a computer chip with a hot spot (bottom), an electron microscope image of defect-free boron arsenide (middle) and an electron diffraction pattern in boron arsenide (top). Researchers at the UCLA Samueli School of Engineering have developed a new semiconductor material — defect-free boron arsenide — that is more effective at drawing and dissipating waste heat than any other known semiconductor or metal materials. Managing heat in electronics is one of the biggest challenges in optimizing performance, in part because as as transistors become smaller, more heat is generated within the same footprint, which in turn slows down processor speeds, in particular at “hot spots” on the chips where that heat concentrates. The advance devised by UCLA has the potential to revolutionize thermal management designs for computer processors and other electronics, or for light-based devices like LEDs. 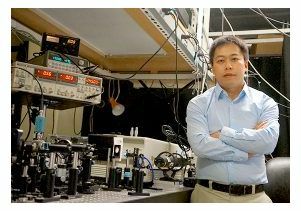 The study, which was published in Science, was led by Yongjie Hu, a UCLA assistant professor of mechanical and aerospace engineering.